Uh Oh: Bernie's Campaign Is Already Breaking Federal Election Laws. Here's How. 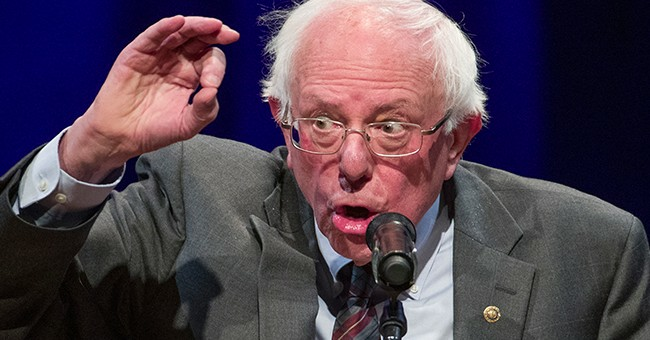 The Coolidge Reagan Foundation (CRF) on Thursday filed a Federal Election Committee (FEC) complaint against Bernie Sanders presidential campaign for multiple campaign violations. According to the complaint, Sanders' campaign is violating FEC laws which prohibit a campaign from hiring foreign nationals. There are three people who are called into question: Erika Andiola, Cesar Vargas and Maria Belen Sisa, all of which have worked in advisory positions for Sanders' 2016 and 2020 presidential campaigns. According to CRF, Sisa made 10 individual contributions to the campaign in the collective amount of $35,000, which violates the Federal Election Campaign Act (FECA). The two other staffers, Vargas and Andiola, were well-known immigration activists who were open about being in the United States through President Barack Obama's Deferred Action for Childhood Arrival (DACA) program, The Washington Examiner reported. Vargas served as Sanders' 2016 national Latino outreach strategist and Andiola served as Sanders' 2016 press secretary for Latino outreach. "There is reason to believe, having previously employed Ms. Sisa, that Bernie 2020 is currently, and knowingly, permitting a ‘foreign national' … to directly or indirectly participate in the decision-making process of persons with regard to the election-related activities of Bernie 2020," the complaint says. According to FECA, a foreign national is not allowed to make a monetary donation or donate "other things of value." And campaigns are barred from accepting those monetary donations. Foreign nationals are also not allowed to work on a campaign in a paid staff role. If Democrats claim to care about foreigners influencing our elections, they should be taking a long, hard look at Bernie Sanders' campaign. The same people who are in an uproar over President Donald Trump's alleged collusion with Russia should be up in arms over this news. But then again, we know they won't. They only care about the end goal, not how you get there. For them, winning elections and remaining in power is goal number one. Dems don't care if they break election and immigration laws as long as they're guaranteed more voters.